I've been through a few weeks of school here at The Royal Academy of Dramatic Art and I'm just now getting the chance to write. They keep us extremely busy and by the time my day is over, I am usually too tired to sit down and write anything. But I'm doing it now, so lets get on with it! The first thing that you quickly realize in attending R.A.D.A is that the faculty are all top notch actors, directors and teachers. All have worked in professional theatre in London and around the world. All have done quite a bit of television and film. Many are writers and poets. All of them are absolute experts on Shakespeare. It's mind boggling to watch a student forget a line during an exercise and then see the movement teacher prompt the student with the next word or phrase. One wonders if they all haven't memorized all the the plays! We start at 9 A.M. most mornings and go until 6 or 6:30 in the evening. Of course it doesn't end there. By the time the 8 weeks have passed we will each have learned and performed one of Shakespeare's sonnets (which we performed today, I did Sonnet 109), a two person scene (I am playing Brutus in a Cassius and Brutus scene from "Julius Caesar"), a crowd scene from Coriolanus, a song from music of the Elizabethan period, a dance from the Elizabethan period, a fight scene based on a Shakespeare play (my group is doing Romeo and Juliet), and in the last two weeks we will rehearse and perform, an abridged production of one of Shakespeare's plays. My group is tackling "The Merchant of Venice" and the second group is doing "Julius Caesar". Our classes consist of basic acting, diction, instruction on iambic pentameter, voice, movement, stage combat, music, text analysis, sonnets, breath control and dance. I am probably missing something but you get the idea. I ran into Alan Rickman twice at the school. I am not really a star struck sort of person, but it was a lot of fun to watch my classmates swoon. He actually is in charge of something at R.A.D.A. so he is there quite often. I saw all the productions put on by the third year graduating students. They were "Come Back to the Five and Dime, Jimmy Dean, Jimmy Dean", "Motortown" and "The Last Days of Judas Iscariot". Of the three I enjoyed Iscariot the most. It was marvelously directed and acted. It was quite a moving production. In fact I saw it twice. I saw Juliet Stevenson and Henry Goodman in "Duet for One". I loved the performances although some of my classmates who saw it found the play to be somewhat dull. I, however think it's a wonderful play. I saw two productions at Shakespeare's Globe: "Rome and Juliet" and "As You Like It". In both instances I bought a groundling ticket for next to nothing, and stood for the three hours on the ground in front of the stage. Both plays were excellent, but "As You Like It" was simply remarkable. 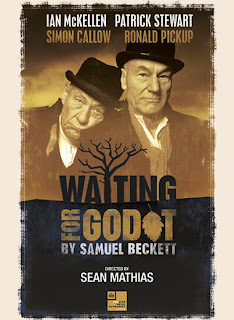 On Saturday a few of us got up at 6 AM to head over the the Haymarket Theatre in the West End to get in line for tickets to "Waiting for Godot" staring Patrick Stewart and Ian McKellen. I sat in the center seat, front row. It was painful on the neck and the ticket was cheap, but I got to see the masters at work. Afterward, I saw Patrick Stewart, outside and asked to sign the program. He was very friendly and down to earth. That's it for now. I will be writing much more often in the weeks to come. I'm in London now and wondering how I haven't yet been run over by a taxi driving the wrong way. Step off the curb at home and you always look to your left first. Do that in London and you will be squashed like a meat pie on the subway tracks. Actually people just sort of ignore the cross walk signs and play chicken with the taxi cabs and double decker busses. Sometimes they even use their baby carriages as improvised human shields. If they see a taxi coming and the crosswalk is red, but they think they might make it accross without being squashed, I have seen them lead with the baby carriage and use it as a method of forcing the taxi cab driver to slow down just enough. After all, running over a full grown Brit is one thing, but squashing a little baby Brit in a carriage is quite another matter. The other day I went for a walk in the City district of London. It's the original London from Shakespeare's day when there were only 200,000 people living here. All the important buildings are there. The stock market is there. The strangest thing happened at about 6 PM. Suddenly there were hundreds of men swarming the streets, no actually, thousands of men swarming the streets and they were all wearing the same damn suit! I swear to God. I assume they were stock brokers because they all had the same sort of stressed out stern expression. All the suits, and I mean all, were either dark gray or dark blue - no exceptions. And all the shirts were white - no exceptions. Some shirts had stripes, but they were always white. Many of the men stopped for a pint at one of the hundreds of pubs in the area. It was as if I was in the middle of a stock broker zombi movie. The last time I was here, about 10 years ago, there seemed to be a McDonalds on every street corner. Now, there are still plenty of McDonalds, but now Starbucks is king. Walk down any major street in London and you cannot walk for five minutes without seeing at least two Starbucks. It's absolutely amazing. I went to the doctor today for a sinus infection. It was absolutely free. I didn't have to pay a penny. I walked out of the hospital feeling like I just got away with shoplifting or something. Get over to Berkeley by Sunday to see The Lieutenant of Inishmore. It's the most disgusting, bloody and hilarious two hours you will ever have. The acting is top notch, the humor out of this world and the gore is beyond belief. It's really not to be missed. GO TO THIS SHOW! If you're a cat lover, be warned, you may be irreparably damaged.